But knowing the favorites is only the first step in filling out a winning March Madness bracket. You also need to look for undervalued teams—teams that have a real chance of advancing in the NCAA tournament but are being overlooked by the general public. In that sense, Duke doesn't look like that great of a pick with almost half of all brackets so far having the Blue Devils picked as the champions. Time is Almost Up! Fill out your bracket now for your chance to win a trip to the 2020 Final Four. Get in the action today! Our bracketvoodoo.com optimization engine looks at this public pick data alongside all of the historical game and player data to evaluate millions of bracket combinations and determine optimal brackets for NCAA Tournament pools of various size and scoring parameters. Here are five teams that our analysis has uncovered as teams that could give you an edge in your bracket this year. Virginia - No. 1 seed / South Regional: As I mentioned above, Duke is the favorite to win it all, but Virginia is not that far behind with a 15.7 percent chance to win it all (just off the 17.3 percent chance we give to Duke). However, eight times as many people are picking Duke to win it all in their brackets than Virginia (with only 5-6 percent of all people taking the Cavaliers). As a result, Virginia is a solid champion pick to build your bracket around, especially in smaller pools. Michigan State - No. 2 seed / East Regional: We see the Spartans as clearly the best No. 2 seed in our Power Rankings, and also twice as likely to win it all than any other No. 2 seed. However, due to the public's obsession with Duke (over five times as many people are picking Duke to advance out of the region than Michigan State! ), going with Michigan State to come out of this region and potentially advance further could give you an edge in your pool. Texas Tech - No. 3 seed / West Regional: According to our rankings, Texas Tech is the best team in the Big 12, and even though the Big 12 had a down year (and Tech got dumped by West Virginia early in the conference tournament), we still see the Red Raiders as a strong No. 3 seed with a legitimate shot of advancing to the Final Four and beyond. Taking a chance on the Red Raiders to upset Michigan and Gonzaga and win the West (or more) could be a great play in larger pools. Virginia Tech - No. 4 seed / East Regional: Here is another contrarian pick in response to how overwhelmingly the public is picking Duke. Interestingly, the committee put the two ACC foes in the same half of the same region, so they would meet as early as the Regional Semifinal. Duke is the favorite for sure, even though Virginia Tech beat a Zion-less Duke just a couple of weeks ago. But our models see the Hokies with a 19 percent chance of making it through that Sweet 16 matchup and only about 5 percent of the public is picking them. Iowa State - No. 6 seed / Midwest Regional: For a slightly higher seeded pick to make a run, take a look at the Cyclones. Among teams seeded No. 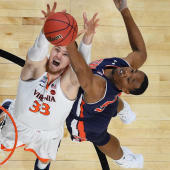 6 or higher they have the best chance of getting into the Elite Eight or further, with a 14 percent chance of making it to the Regional Finals and a 5 percent chance of getting to the Final Four. For larger pools or pools with a seed bonus, picking them to go on this run could be a diversifier against all of those brackets with an all-Carolina Final. While everyone should consider these teams, how far you should project them in your bracket is a function of your pool specifics, most notably your pool's size and scoring system. Michigan State may not be a great pick in your mega-pool in Michigan (unless your buddies are all Michigan alums). On the other hand, you might seriously consider Virginia Tech to win it all in that 3000 person mega-pool, but the Hokies would be a foolish pick in your 10-person office pool. Check out the bracketvoodoo.com March Madness optimization engine now to find more top picks and identify which picks work best for your particular bracket. You can also enter your top picks in our Bracket Analyzer and learn your chances of winning and some additional advice on how to make your bracket better.